Kyogre does not evolve/is not evolved into. X A mythical Pokémon said to have swelled the seas with rain and tidal waves. It battled with Groudon. X Der Legende nach erschuf sein Regen das Meer. Es und Groudon lieferten sich einen langen Kampf. X Ennemi juré de Groudon, la légende dit qu’il a étendu les mers en causant déluges et raz de marée. X Pokémon legendario que aumentó los mares con diluvios y maremotos. Fue un enemigo acérrimo de Groudon. X Nella mitologia, Kyogre è il Pokémon che ha ampliato i mari con megaonde e megapiogge. Nemico di Groudon. X 많은 비와 큰 해일로 바다를 넓힌 신화의 포켓몬이다. 그란돈과 격하게 싸웠다. Y It is said to have widened the seas by causing downpours. It had been asleep in a marine trench. Y Man sagt, es habe die Meere vergrößert, indem es es regnen ließ. Es schlief in einem Meeresgraben. Y On dit qu’il a fait monter les eaux en causant des pluies diluviennes. Il somnolait dans une fosse marine. Y Se dice que aumentó el nivel del mar a base de aguaceros. Ha estado durmiendo en una fosa marina. Y Si dice che abbia ampliato i mari provocando piogge torrenziali. Si è assopito in una fossa marina. Y 많은 비를 내리게 하는 능력으로 바다를 넓혔다고 전해진다. 해구의 밑바닥에서 잠들어 있었다. Omega Ruby Kyogre is said to be the personification of the sea itself. Legends tell of its many clashes against Groudon, as each sought to gain the power of nature. Omega Ruby Es heißt, Kyogre sei die Personifizierung des Meeres. Legenden zufolge hat es in seinem Bestreben, sich die Naturenergie anzueignen, viele Male gegen Groudon gekämpft. Omega Ruby Un Pokémon considéré comme l’avatar des océans. Selon les légendes, il a disputé de nombreux combats avec Groudon pour contrôler l’énergie de la nature. 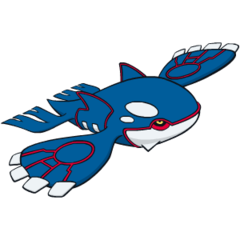 Omega Ruby A Kyogre siempre se le ha descrito como el Pokémon que expandió los océanos. Varias leyendas cuentan que libró combates contra Groudon en repetidas ocasiones para tener el control de la energía de la naturaleza. Omega Ruby Si dice che questo Pokémon abbia un profondo legame con le distese dei mari. Le leggende narrano dei suoi continui scontri con Groudon per ottenere l’energia della natura. Omega Ruby 바다의 화신이라 전해지는 포켓몬. 자연의 힘을 갈구하여 그란돈과 사투를 반복한다는 전설이 있다. Alpha Sapphire Through Primal Reversion and with nature’s full power, it will take back its true form. It can summon storms that cause the sea levels to rise. Alpha Sapphire Mithilfe von Naturenergie kann es eine Protomorphose durchführen und so seine ursprüngliche Form zurückerlangen. Dadurch kann es Stürme erzeugen und das Meer vergrößern. Alpha Sapphire Grâce à l’énergie de la nature, il peut accomplir sa Primo-Résurgence pour retrouver son apparence originelle. Ce pouvoir lui permet d’appeler de terribles déluges pour étendre les mers. Alpha Sapphire Kyogre se sirve de la energía de la naturaleza para realizar su Regresión Primigenia y recobrar su apariencia primitiva. Con tal poder, puede desencadenar tempestades para expandir los océanos. Alpha Sapphire L’energia della natura può causare l’archeorisveglio di questo Pokémon, facendolo tornare al suo aspetto originario. Può provocare diluvi torrenziali in grado di espandere la superficie dei mari. Alpha Sapphire 자연의 힘에 의해 원시회귀하여 원래의 모습을 되찾는다. 그 힘은 폭풍을 불러들이며 바다를 확장한다. Ruby Kyogre has the power to create massive rain clouds that cover the entire sky and bring about torrential downpours. This Pokemon saved people who were suffering from droughts. Sapphire KYOGRE is named in mythology as the POKeMON that expanded the sea by covering the land with torrential rains and towering tidal waves. It took to sleep after a cataclysmic battle with GROUDON. FireRed This POKeMON is said to have expanded the sea by bringing heavy rains. It has the power to control water. LeafGreen This POKeMON is said to have expanded the sea by bringing heavy rains. It has the power to control water. Emerald KYOGRE has appeared in mythology as the creator of the sea. After long years of feuding with GROUDON, it took to sleep at the bottom of the sea. Diamond It is said to have widened the seas by causing downpours. It had been asleep in a marine trench. Pearl It is said to have widened the seas by causing downpours. It had been asleep in a marine trench. Platinum It is said to have widened the seas by causing downpours. It had been asleep in a marine trench. HeartGold A mythical Pokémon said to have swelled the seas with rain and tidal waves. It battled with GROUDON. SoulSilver A mythical Pokémon said to have swelled the seas with rain and tidal waves. It battled with GROUDON. Black It is said to have widened the seas by causing downpours. It had been asleep in a marine trench. White It is said to have widened the seas by causing downpours. It had been asleep in a marine trench. Black 2 It is said to have widened the seas by causing downpours. It had been asleep in a marine trench. White 2 It is said to have widened the seas by causing downpours. It had been asleep in a marine trench.